Its YOUR Prom. Now dress like it. Your style is unique. It says a lot about how you are. Sets you apart. Believe me, we get it! An all black prom tux is definitely very Johnny Cash-cool. How about adding a color pocket square that matches your date's outfit? We got all kinds of ideas up our sleeve. Come by and let one of our consultants share some tips and tux secrets with you to help you make this a night to remember! The earlier you place your prom tuxedo rental order, the more you save. Are you waiting on your date to see what color your tie should be? Don't take the chance. Place your tuxedo order now, you could always change the color of your bowtie later. 15% off: Place your prom order before March 31st, and get 15% off any tuxedo rental + free shoe rental. 10% off: Place your prom order before April 30th, and get 10% off any tuxedo rental + free shoe rental. 5% off: Place your prom order before May 31th, and get 5% off any tuxedo rental + free shoe rental. The time of baggy tuxedo jackets and pants has come and gone! Thankfully! At Tommy's Tuxedos®, we offer ultra-slim, slim, modern and traditional fit tuxedo styles and trousers to match our clients' personalities. Always staying ahead of the curve, our stores have undergone some recent renovations. Drum roll please...the Tommy's Tuxedos TuxBar! Now our clients can chill by the TuxBar, pick out their prom look digitally, charge their electronic devices comfortably on our hip stools, and relax while we put the last minute details on your Prom gear. 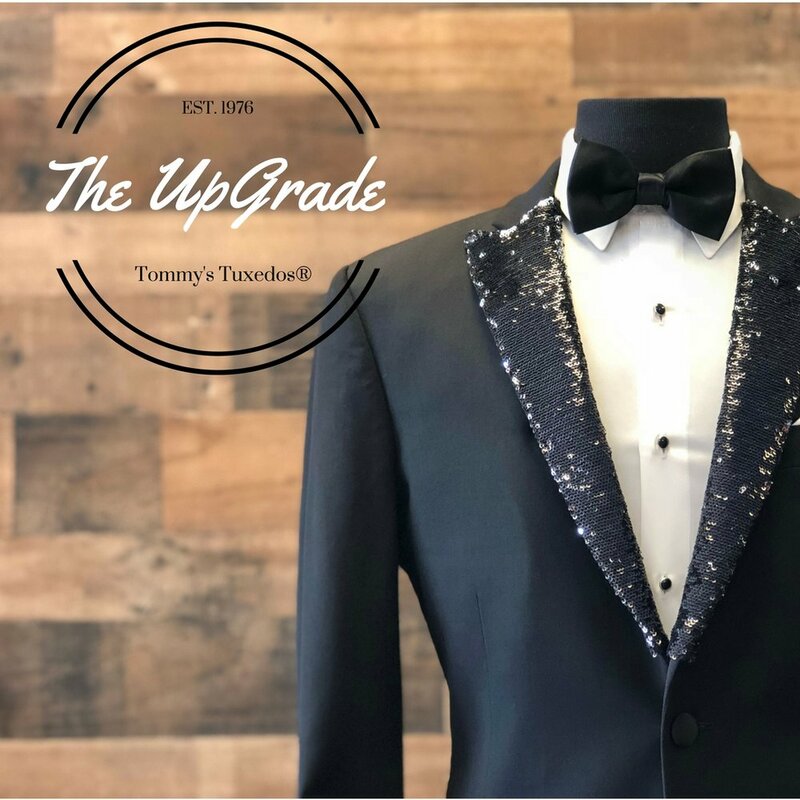 Add a little bling to any Peak Lapel tuxedo for prom with our custom-made black sequin lapel or black suede for a statement look. Yeah, we know, we rock.